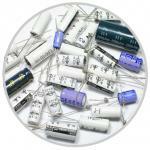 Capacitors as energy storage devices don�t really work. As power capture/delivery devices, however, they are excellent. Especially if the capacitors are supercaps, which can store enough charge that their very high power capture and delivery capabilities can become functional in modern electronic devices (when paired with an appropriate energy storage/conversion device). Impedance testing is also a challenge for these very low impedance devices. Supercapacitor�or ultracapacitor, or electrochemical double layer capacitor�researchers are striving to achieve two things: stability to higher voltages, and very high (accessible) surface area to mass ratios. On the one side, these are achieved through improved electrolytes, and on the other through improved electrodes. While these are fundamentally materials questions, the performance is electronic and electrochemical, and therefore, the testing to determine the quality of a given electrolyte or electrode is electrochemical. Since supercaps are rated for lifetimes in the hundreds of thousands to millions of cycles, more precision is necessary when performing cycling experiments than with batteries that are only rated to last a few hundred to a few thousand cycles. Impedance testing is also a challenge for these very low impedance devices. We have tested quite a few supercapacitors at Gamry and worked with supercap researchers. If you are new to the field, or to Gamry, you may want to read through our application notes. Along with our application notes on low impedance EIS, Gamry has several supercapacitor-specific application notes available.